Congratulations to Svetlana Gromenkova, Event #15 Champion! As the final card fell, Svetlana Gromenkova was wrapped in the collective embrace of her railbirds as she took down her first major title and her first WSOP bracelet. Usually a stoic figure at the table, Gromenkova was all smiles as she celebrated with her friends. 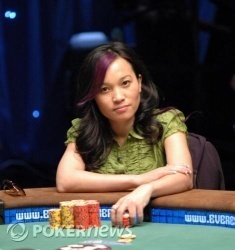 Anh Le is unfortunately the bridesmaid once again, making her second career runner-up finish in the WSOP Ladies Event tonight, having finished second to Jennifer Tilly in 2005. She was clearly emotional in her post-game interview, but her face lit up when her daughter Isabella was mentioned. Le gave her five-year-old a smile and a wave through the camera and departed the stage gracefully. 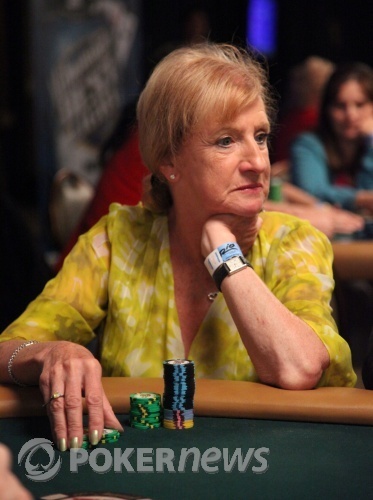 Congratulations to Svetlana Gromenkova on her first WSOP bracelet! Anh Le has the button. She makes it 100,000 to go, Gromenkova moves all in and Le calls. Gromenkova has Le covered. The flop is and Le needs an ace or an eight to survive. The turn is the making Gromenkova a set, but Le can still catch an eight for a straight. The river, though, is the and Svetlana Gromenkova is the 2008 Ladies World Champion, winning her first WSOP bracelet and $244,702. Anh Le is our runner up and earns $144,567 for her finish. Svetlana Gromenkova has the button. She gives Le a walk. Anh Le has the button. She raises to 100,000, Gromenkova moves all in, Le folds, and Gromenkova wins the pot. Svetlana Gromenkova has the button. She raises to 75,000 and picks up the blinds and antes. If John Phan shows up in some pictures, it's because he just showed up at the final table. After Anh Le took down that last pot, Phan came into view and congratulated her on her performance so far. He is now sitting over in Le's cheering section in the front row. Greg "FBT" Mueller is right next to him viewing the battle between these two ladies as well. Anh Le has the button. She raises to 100,000 and takes down the blinds and antes. Svetlana Gromenkova has the button. She raises to 75,000 and Le calls. The flop is and both players check. The turn is the and they check it again. The river is the . Le bets 90,000, Gromenkova mucks and Le wins the pot.